Everyone searches for enlightenment. Some look in far off lands, some look within. Some do both. Perhaps, that is why Ladakh – the region of monasteries and mountains – is so conducive to finding the answers you are looking for. You may find them hidden in a corner of a gompa (the Tibetan style monastery). Or in the rhythmic chants of monks. Could Buddha speak to you silently? Or do the secrets whisper in the winds that swirl around the slopes? Whatever the case, Ladakh is a land that lends itself generously to those looking for the spiritual. 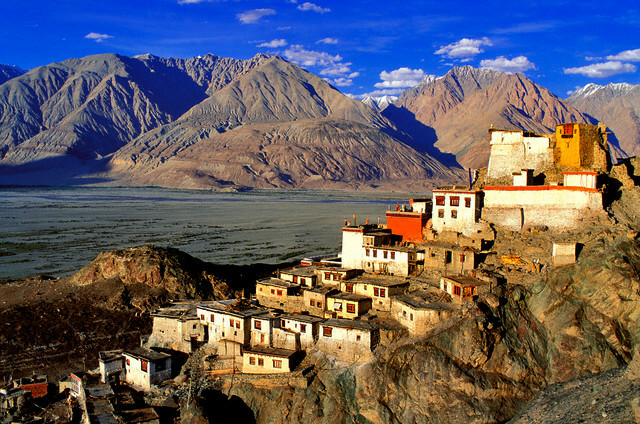 So, let’s take a trip together and visit some of the most beautiful monasteries that grace the mountains of Ladakh. Hemis Monastery is one of the most well-known and beloved monasteries in Ladakh. 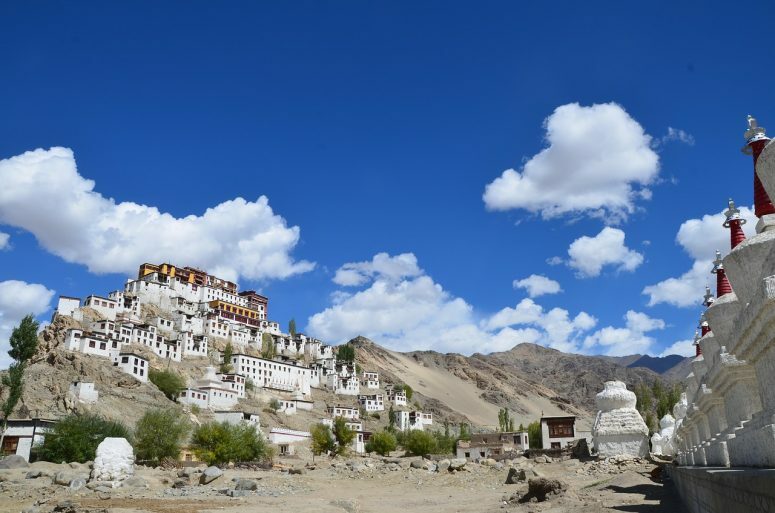 It is also the biggest monastery, located 49 kilometres from Leh. Although its origins stretch back to the 11th century, it was re-established in 1672 by Sengge Namgyal – a Ladhaki king. Hemis is visual treat for the eyes – the pristine white walls of the monastery are festooned with intricate balconies, colourful windows and sturdy pillars. Every year, the monastery holds the Hemis Festival, which is filled with music, dance and age-old rituals. The festival is dedicated to Lord Padmasambhava (an 8th century Buddhist master, known as Guru Rinpoche, and also revered by many as the second Buddha). The sacred rituals carried out during the festival are believed to bestow spiritual strength and good health. You can watch the graceful rhythms of the mystic Mask Dances, or immerse yourself in the music of cymbals, pan drums, wind instruments and small trumpets. Meaning is found everywhere at the Hemis Monastery. Destiny often takes us on a different journey – away from what we imagined. The foundation of Thiksey Monastery, which is located on top of a hill in Thiksey, is a story of predestination and discovery. Legend has it that in the mid-15th century, two monks (Sherab Zangpo and Palden Zangpo) were performing sacred rituals and had taken the holy offerings to a cliff edge to throw down the valley. At that very moment, a pair of crows appeared and carried the offerings away to the other side of the hill. When the monks looked for the offerings, they found them in perfect condition on the top of the hill, and so they interpreted it as a divine order to build the Thiksey monastery there. Today, Thiksey stands at that very spot, spearing out of the rocks into the clear, blue sky. Inside the dazzling white monastery, you’ll find 10 temples, a home for the monks, an assembly hall, a nunnery and more. It also contains one of the largest structures in Ladakh – the Maitreya Buddha statue, which is two stories tall. At Thiksey, who knows what other wonders you’ll find? Perhaps your glimpse into this serene and grand monastery might also lead to different discoveries and a new path for yourself. We find God in the big and little things. Sometimes it’s in nature. Sometimes its in the smile of a loved one. And sometimes we may find God nestled in the mountains, dressed in splendour, waiting to bless the spiritual travellers that cross his path. 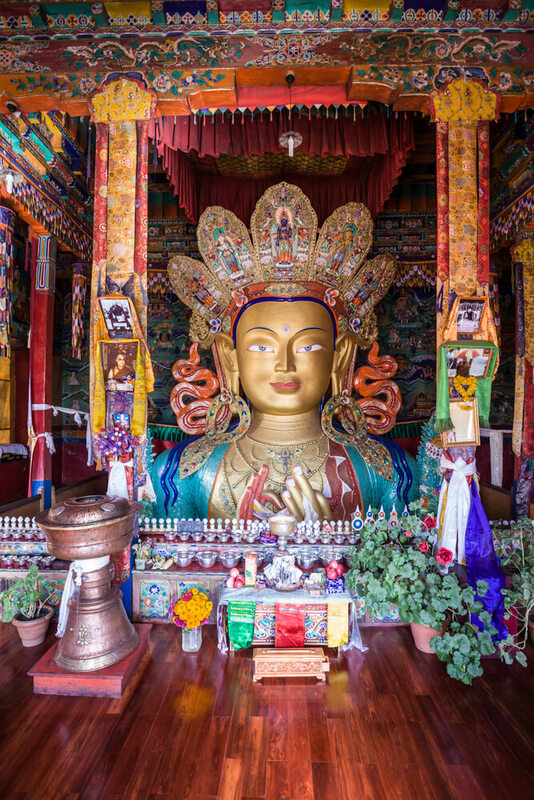 At Diskit, the oldest and largest monastery in Nubra Valley, travellers will meet God in the form of a stunning 100 ft. statue of Maitreya Buddha. Diskit, which was built in the 14th century, is located at an altitude of 3142 meters. The hilltop where the monastery is located opens up to stunning views of Nubra Valley. Choose the path to enlightenment by climbing up the stone cut steps to the monastery. Take in the huge drums, the cupola and painted frescos and sacred Mongolian and Tibetan texts that are lovingly featured in the monastery. Spirituality and belief are all around us. However, there are some places that might have that extra touch. Spituk monastery, also known as Pethup Gompa, is one of them. Founded in the 11th century by Od-de, Spituk is believed to be the site where an exceptional religious community would rise. Walk amongst the 100 monks who currently live and worship and the monastery. Stand in the presence of the magnificent Kali statue at Spituk. Gaze out at stunning views of the Indus Valley. Interact with tourists and Buddhists from around the world, as they embark upon a spiritual journey like your own. If your soul is hungry, Spituk can satisfy it. For answers to our questions, we often find ourselves looking back, seeking the source. 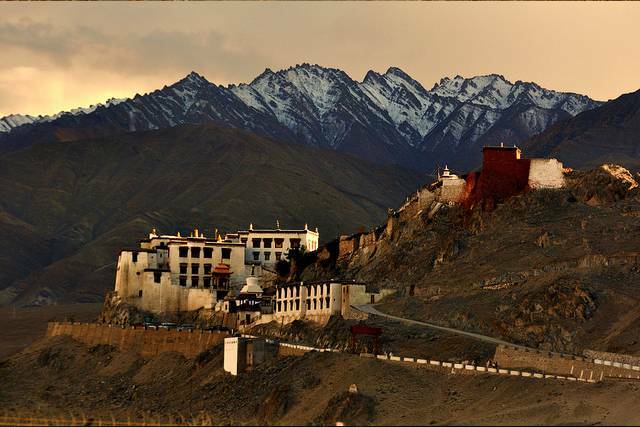 Well, if you’re looking back, why not go all the way back – to Ladakh’s oldest monastery. Within these ancient walls, you’ll find the Maitreyi Buddha – gilded in gold – and 75 feet tall. 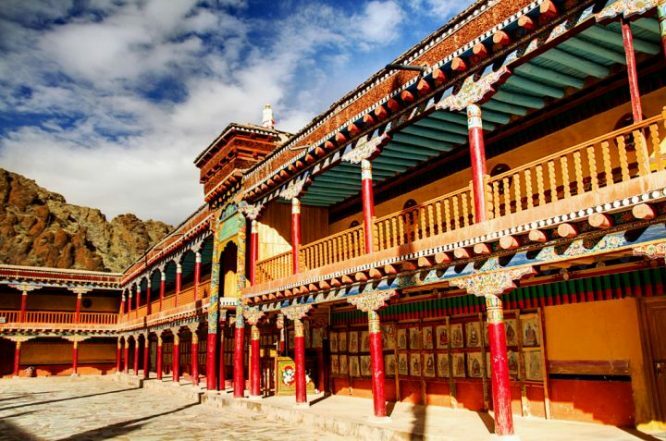 Built by the 5th Monarch of Ladakh in the 11th century, the monastery boasts of paintings, murals, stone statues and more. It is a living testament to the endurance, the principles and the strength of Buddhism. It also houses a school and a library open to all visitors. The library contains old books, manuscripts and books on the teachings of Buddha. Do note, that in these packages, you may notice only a few monasteries present. However, we do create customised packages, where you can decide which ones you want to experience. The meaning of life can be elusive and sometimes evasive. However, if there’s a corner of the world where you’ll find it, it’s in Ladakh. So, what are you waiting for?